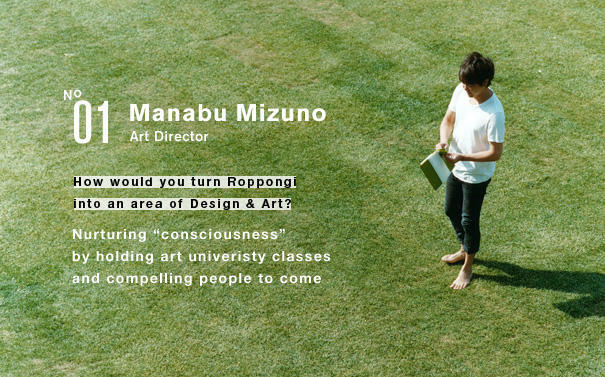 NO01 Manabu Mizuno How would you turn Roppongi into an area of Design & Art? 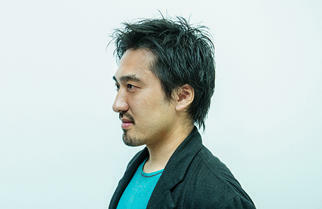 Manabu Mizuno is a creative director who has been involved in many talked-about projects, from the design of the logo of the Ministry of Agriculture, Forestry and Fisheries to "iD" branding for NTT docomo, the art direction of adidas and "Single Collection Vol.2" by Hikaru Utada. 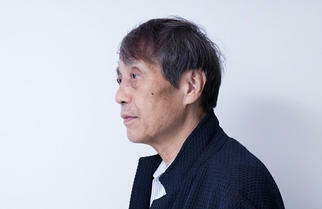 He has also designed the campaign posters for Tokyo Midtown. The garden at Tokyo Midtown, where the wind passes refreshingly through, is one of Mizuno's favorite spots. On a day in May when the weather was like early summer, Mizuno sat in the garden and told us his thoughts on the future of Roppongi as an area of design and art. Filled with foreigners, Roppongi is a bustling town, day and night. The image we have today of Roppongi as an entertainment district is said to have been started by Nicola's Pizza House (established in 1954) which is known for introducing the pizza to Japan. It may seem as if the appearance of this area has been changing constantly, but it was only after Nicola's Pizza that all kinds of foreigners began to gather, and it has taken nearly 60 years after the war for Roppongi to become what it is now. I was raised in Chigasaki, and when I was young, it was a bit hard to like the busy, run-down image of Roppongi, and the way it seemed to be engulfed by trends, so I didn't come here that much. Recently though, I sometimes visit to watch movies and browse the bookstores, and take my children to the park on my days off. "A place for sociliazing" and "a place where people gather" might sound similar, but mean slightly different things. "A place for sociliazing" suggests a place where some sort of event is held and people are drinking and making a noise. " A place where people gather" seems to imply a place where people come together even if they have nothing particular to do, as if they have been drawn by the sunlight. Roppongi used to be place where the sole purpose was to socialize. You had to have some kind of reason to come here. Today though, there is culture and entetaiment in the form of movie theaters and art museums, and in places like Tokyo Midtown, there are pleasant, soothing areas surrounded by lawns and greenery. With an increase in things that are convenient and enriching for people's lives, I think Roppongi is becoming more attractive as "a place where people gather". Rudolph Giuliani, as mayor of New York City, took the initiative of stamping out crime in New York and making large-scale redevelopments. This helped restore safety and order to the city, and the image of New York was greatly changed. People have now come together in the nice places, and the presence of these peole are attracting a flow of more people. I think Chigasaki, where I was born, is appealing not because of any events that are held, but because there is the sea, and a good environment. The big developments in Roppongi gave birth to Roppongi Hills, the National Art Center, Tokyo, and Tokyo Midtown, and these facilities have brought in a breath of fresh air to the area. The reasons for people coming to Roppongi have inevitably changed a lot. 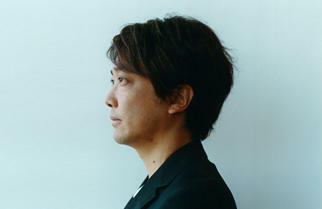 I started becoming involved with Tokyo Midtown through my job as a designer, creating advertisements and posters. But the activity of making posters is short-lived and the function of posters usually end very quickly. I don't think that a short-term project will offer easy solutions to Tokyo Midtown's aim of making big developments and expanding the town. That's why when doing my work, I've tried to take the long-term perspective, discussing things in depth with my clients. The fact is however, that no matter how precisely you draw the bluepint, not everything turns out as planned. When it comes to actual implementation, you need to remember to be flexible to the factors of time and place, and let your plan grow from there. It's important to really understand that art and design help make people's lives abundant. With a piece of work, it doesn't matter who designed it or which brand it belongs to. A work should be something that a person who has nothing to with design - like my mother for example - say, "That's lovely." Unfortunately, the notion still seems to exist that art and design are lofty things. There seems to be the feeling that there are the cool people who understand art and the uncool peope who don't. Of course, it's important that things are of beautiful shape, but it's more important for us to properly explain to people that the very act of creating art and design is enriching. And in order to be convincing, designers themselves need to make efforts and work really hard. Apart from my "good design company", I've set up a company called "THE kabushikikaisha" to allow myself, as a designer, to try out new things. Contemporary society is brimming with so many different kinds of products, from expensive to cheap items, from high-spec to low-tech items, from items that are sleek to items that are unpolished. Perhaps neither the consumers nor the manufacturers no longer know what products are really necessary. What I'm doing now is searching for products like "Levi's 501" which can be called "THE jeans" - products which are so satisfying so that you don't need anything else. The plan is to scrutinize the things that have been made in the past and sift through them. By analyzing these products and sorting out the elements of design, I want to create the best possible products that would deserve to be called "THE so and so". I feel that as a designer, I should contribute to society by looking at things with my own eyes, grasping the essentials, and putting what I have learned out into the world. "THE glass", very simple-shaped heat-resistant glass. You may surprise to realize that these glasses come in the same sizes as tumblers of the Starbucks (shot/tall/grande). To realize the scheme of transforming Roppongi into an area of design and art, it's necessary to take care of the "structural" aspect such as the buildings and city planning, and at the same time, to nurture the "non-structural" aspect - namely the "conscisouness" of people. To create that consciousness, there must be a place where designers, artists and people from the creative industry come spontaneously every day. Perhaps you could hold exhibitons and symposiums every day or every week, and create a situation where these people will be compelled to visit frequently. Or with the Tokyo Midtown Award, perhaps a company affiliated with this area could undertake product commercialization and sales of the award-winning works. And the profits from the sales could be given back to the award. These are a few ideas. I think it's important for Mitsui Fudosan and Tokyo Midtown to take the helm and create specific business models. Another vital thing is to set up a self-running system. In other words, instead of simply making proposals, you should build a system where the people and the companies you invite to this place can become independent and grow. For example, if you are thinking of having art and design at the core, you might invite an art university to come here. Of course, there are currently related facilities within the Tokyo Midotwn Design Hub, but what I mean is that you could have a real unverisity system here and hold classes within the premises. By having a university here, there may be companies which will show interest in becoming cooperators. And by making the classes available to not only students, but to the general public, there may be further secondary benefits. These projects may require considerable time and trouble, but you should not give up even if you don't get quick results. These projects should be passed on to the next generation, and for that end, I hope you will keep making proposals and watch carefully for opportunities that arise. I think it's vital to have a cause in everything you do. In my job, I sometimes meet company owners who personally have clear goals, but who do not vervilize or visualize them, and who don't have statements that can be shared by the workers. Even if there is the intent, unless you clearly express your intent through words, you won't get results. 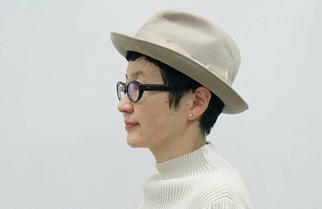 To turn Roppongi into an area of design and art, you must clarify the framework. Things will not move in a big way unless you have clear answers to questions like, "Why do I want to do it?" and "Who wants it done and in what way?" Design and art have so far been treated as highbrow things to be kept in a black box, but this situation isn't going to continue much longer. It's time for us to open that black box, to make specific business models, and renew our awareness of the benefits of design and art. 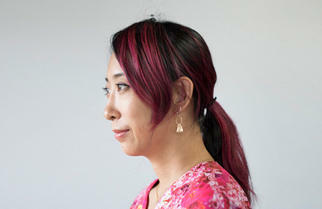 Born in 1972 in Tokyo, and grew up in Chigasaki. 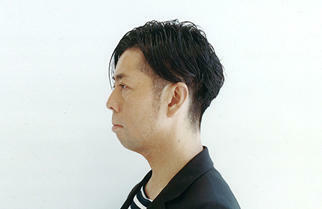 Graduated in 1996 from Tama Art University's Design Department of the Faculty of Art and Design. Worked for Pablo Production and Draft before setting up "good design company" in 1999. Mizuno is involved in the comprehensive direction of designs, from creating the foundation of brands, to logo design, product planning, package design and interior design. 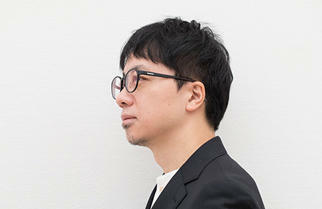 His major works include the "iD" branding for NTT Docomo, the logo for the Ministry of Agriculture, Forestry and Fisheries, and the "Kumamon" character for Kumamoto Prefecture. Mizuno has also been responsible for the art direction of the "Van Gogh" exhbition at the National Art Center, Tokyo, and the "Le Corbusier" exhibition at Mori Art Musuem.